While defining “tech” is always a blurry, partly subjective task, we have based our analysis on three criteria to select tech companies. First, tech companies are entities that either produce technological goods or services and/or rely (heavily) on technological processes internally. The second criteria is the combination of industry and business model. The full list of business models and industries included can be found in Appendix B. Third, companies older than 1990, as well as corporates and multinationals, have been excluded. Similarly, definitions for startups and scaleups are widely inconsistent. For this analysis, we rely on the number of employees to group smaller companies (less than 50 employees) into startups and larger companies (more than 50 employees) into scaleups. 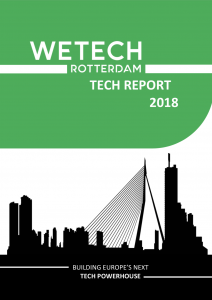 We have identified 519 tech companies in the Rotterdam greater region. The ICT sector, largely carried by software companies, accounts for 28% of Rotterdam-based tech firms, making it the largest sector. Media & Communication (18%) is the second- largest and Energy (11%) the third-largest sector. Note that some companies are included in multiple sectors. These findings are both encouraging in terms of the high inception rate of companies, but disappointing in low ability for seed stage companies to progress to early-growth, let alone late-growth stages.